Joey Yap is the founder of the Mastery Academy of Chinese Metaphysics, a global organization devoted to the teaching of Feng Shui, BaZi, Mian Xiang and other Chinese Metaphysics subjects. He is also the Chief Consultant of Joey Yap Consulting Group, an international consulting firm specializing in Feng Shui and Chinese Astrology services. 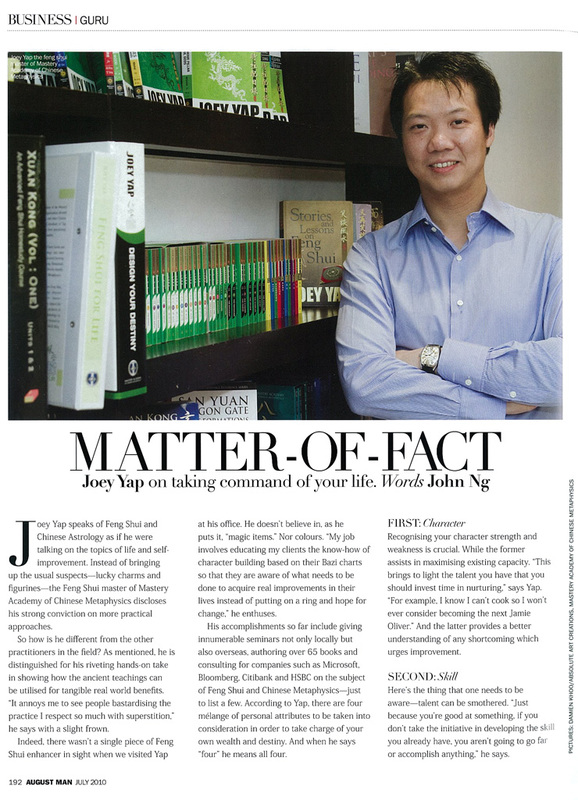 Joey Yap first began learning about Chinese Metaphysics from masters in the field when he was fifteen. Despite having graduated with a Commerce degree in Accounting, Joey never became an accountant. Instead, he began to give seminars, talks and professional Chinese Metaphysic consultations in Malaysia, Singapore, India, Australia, Canada, England, Germany and the United States, becoming a household name in the field. By the age of twenty-six, Joey became a self-made millionaire and in 2008, he was listed in The Malaysian Tatler as the Top 300 Most Influential People in Malaysia and Prestige's Top 40 Under 40. His practical and result-driven take on Feng Shui and BaZi sets him apart from other older, traditional masters and practitioners in the field. He shows people how the ancient teachings can be utilized for tangible REAL world benefits. The success he and his clients enjoy, thanks to his advice, is positive proof that Feng Shui and BaZi Astrology works, whether everyone believes in it or not! Today, Joey has helped and worked with governments and the wealthiest people in Singapore, Hong Kong, China, Malaysia and Japan. His clients include multinationals, developers, tycoons and royalties. On Bloomberg, he is featured on-air as a regular guest on the subject of Feng Shui annual forecasts. He was an invited speaker at the prestigious CEO Space in Las Vegas, where top CEOs and successful entrepreneurs worldwide converged to learn from the best of the best. He is retained by twenty-five top Malaysian property developers to help determine suitable candidates to take top management, change their space and Feng Shui mechanism, the way they make decisions, and understand the natural cosmic energies that can influence their decision-making. Joey is devoted to using his success to advance the field he works within. The Joey Yap Consulting Group is the world's largest and first specialized metaphysics consultation firm. 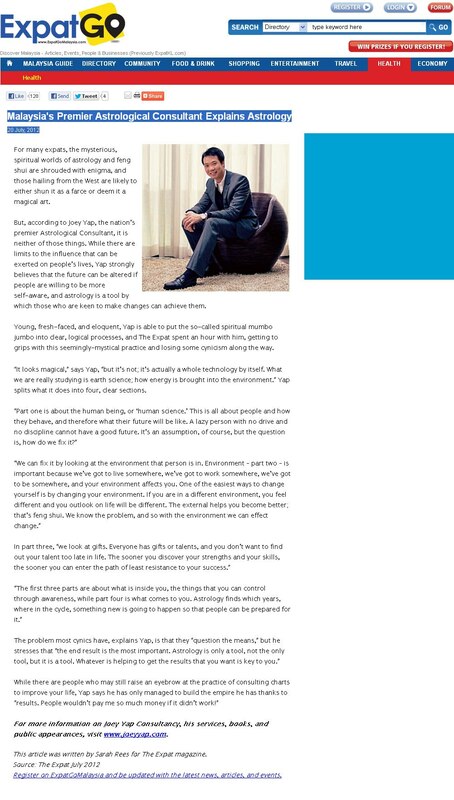 His consultancy, and professional speaking and training engagements with Microsoft, HP, Bloomberg, Citibank, HSBC and many more have seen the benefits of Classical Feng Shui and BaZi find their way into corporate environment and culture. Celebrities, property developers and other large organizations turn to Joey when they need the best. After years of field-testing and fine-tuning his teachings, he has put together a team in the form of Joey Yap Research International. The objective of this Research Team is to scientifically track and verify the positive impact of Feng Shui and BaZi on subjects and ultimately to assist more people in achieving their life goals. The Mastery Academy of Chinese Metaphysics which Joey founded teaches thousands of students from all around the world about Classical Feng Shui, Chinese Astrology and Face Reading. Many graduates have gone on to become successful in their own right, becoming sought after consultants, setting up their own consultancy businesses or even becoming educators, passing on Chinese Metaphysics knowledge to others. Joey has also created the Decision Referential Technology™, offering decision reformation training on how to make better decisions in business and in personal life. He has led his team of highly trained consultants to help clients create more positive change in corporate boardrooms and increase production in their companies, helping people see their business outlook for each year so they may anticipate, plan and execute their strategies successfully. Joey's work has been featured regularly in various popular global publications and networks like Time, Forbes, the International Herald Tribune and Bloomberg. He has also written columns for The New Straits Times, The Star and The Edge - Malaysia's leading newspapers. He has achieved bestselling author status with over 100 books, on Feng Shui, Chinese Astrology (BaZi), Face Reading and Yi Jing, which has sold more than three million copies to-date. Many of his titles have also topped the Malaysian and Singaporean MPH Bookstores' bestseller lists. 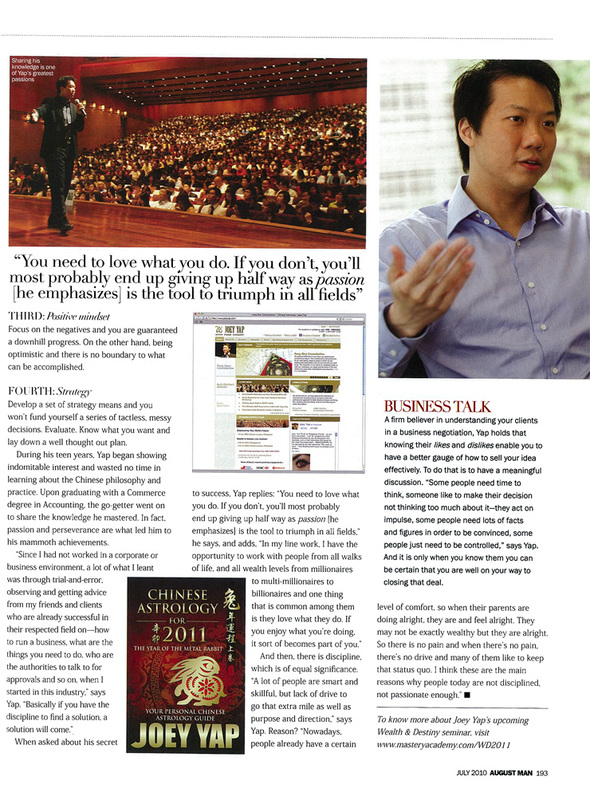 As a world leader in the field of Chinese Metaphysics, Joey's success is not limited to matters of Feng Shui and BaZi. Although his success is a product of them, he is also a successful entrepreneur, leading his own companies and property investment portfolio. When not teaching metaphysics or consulting around the world, Joey is a Naruto fan, avid snowboarder and is crazy for fruits de mer.